Structural, heavy duty Bird Netting is a tough plastic mesh that seals off all structural openings and pest bird roosting havens. Easy to maintain and aesthetically pleasing. For maximum results, use netting with a combination of Bird-X Bird deterrent products. Durable Polypropylene. Roll size is 200 ft. x 14 ft. Best installed with Bird Net Mounting Clips. 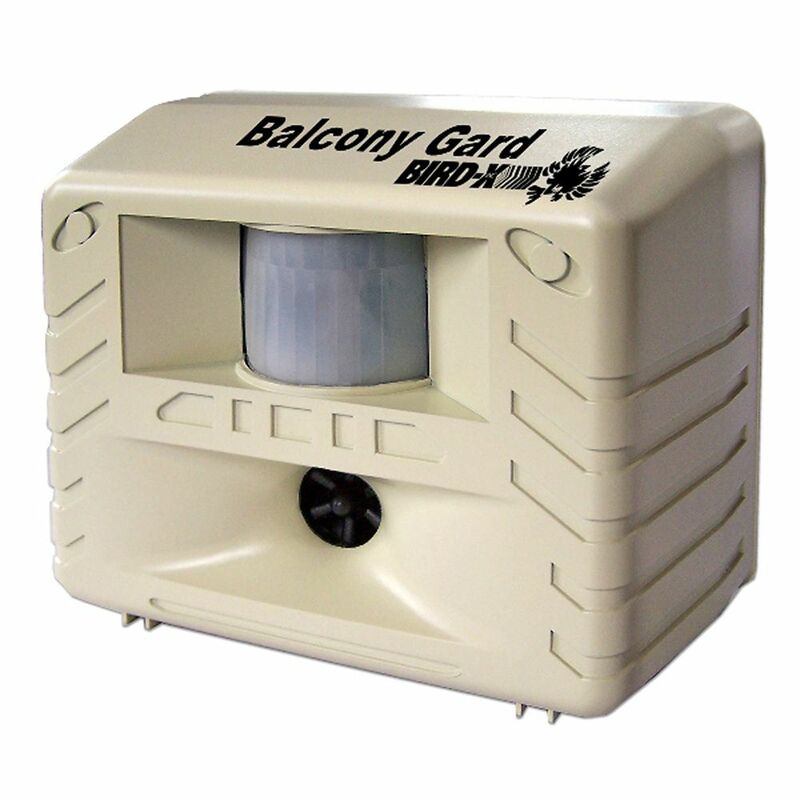 Bird-X Balcony Gard Ultrasonic Bird Chaser Repeller Bird Control Repellent The Bird-X Balcony Guard Ultrasonic Bird Chaser utilizes ultrasonic sound waves to efficiently and effectively frighten, annoy and control pigeons, other birds and bats within a 900 sq. ft. range. A weatherproof exterior helps this repeller last for reliable outdoor use. Provides effective and safe bird control with silent signals, ideal for porches, decks, patios, balconies or any area. Motion sensor included. AC cord included. Bird-X Balcony Gard Ultrasonic Bird Chaser Repeller Bird Control Repellent is rated 2.6 out of 5 by 85. Rated 1 out of 5 by HomeDepotCustomer from Not working should the light be red? ... Not working should the light be red? Rated 1 out of 5 by mgdr from Does not work-no effect at all-on the flocks of birds... Does not work-no effect at all-on the flocks of birds that sit and chirp in our bushes-thanks to thoughtless neigbor's placement of multiple bird feeders-and the absence of bushes and trees in their yard. Vinegar spray, shiny ornaments, and black netting on the bushes were far more effective. Rated 5 out of 5 by Yooper from Put it to work right when I received it. Used to have birds raiding my garden all the time. No bi... Put it to work right when I received it. Used to have birds raiding my garden all the time. No birds this year ruining the produce. Lots of them in the trees but not bothering the garden. Only way I know it's working is the red light indicating it is on.